And as me and my team at the Foreign Office reflected on this, we wanted to ask ourselves a question as to whether the FCO, which has one of the best global networks of any diplomatic service – we basically after the Americans and the Chinese have the third biggest diplomatic network of any country alongside the French – and we wanted to ask ourselves a question as to whether we really are doing as much as we possibly could. And we wanted to do this not just because freedom of worship is a fundamental human right, but because also freedom of worship is the invisible line between open societies and closed societies. Where freedom of worship is hampered or prevented, then usually that’s a sign of lots of other things going wrong, and we wanted to make sure that the UK is doing everything to champion the values that we all believe in. I am a Johnny-come-lately to this, because we have in the Foreign Office a fantastic minister, Lord Ahmad, who has been championing religious freedom since before I became Foreign Secretary, and himself comes from a Muslim minority faith – the Ahmadiyya community that have effectively been banished from Pakistan because it’s not safe for them to be in Pakistan, and have had to move away. And many of them are based in the UK, but actually all over the world, so this is someone who knows from his own life the dangers. But very much on his advice, we particularly want to look at the issue of Christian persecution. Because the evidence is that 80 per cent of all the people who are suffering religious persecution are Christian. And we want to, if I can put it this way, banish any hesitation to look into this issue without fear or favour that may exist because of our imperial history, because of the concerns that some people might have in linking the activities of missionaries in the nineteenth century to misguided imperialism. And all those concerns may have led to a hesitation to really look at this issue properly, and we don’t want that to happen. And in order to keep us on the straight and narrow I’ve asked the Bishop of Truro, Bishop Philip Mounstephen, to do an independent review, and to work with all of you, to work with the FCO, and to tell us how we should approach this and what more we can do. And what I want to do is, what I’m hoping the outcome of this will be is, first of all in practical terms, I want to make absolutely sure when I am meeting a foreign minister, a prime minister or a president in another country, and there’s an issue concerning religious freedom, and in particular the rights of Christians, I want to make sure that it is absolutely on my list of things that I need to raise. Sometimes you do these things publically (sic), sometimes you do them privately, but we should always be doing them if they need to be done and I want to make sure that happens and I don’t think it does at the moment. But secondly, I want to see what we can do to build an international coalition of countries that are concerned about this so that we can play, I think the role that Britain has played for many years, which is whilst recognising that we’re not a superpower, at the same time, not underestimating the power and influence that we have as a very well-connected country to bring together other countries that share our values and give a voice to people who don’t have a voice. And I think the final point I want to make which everyone in this room will be well aware of, but I’m not sure necessarily that the public outside are: we are a wealthy country and we sometimes think that when it comes to the rights of Christians this is really about wealthy people. The people who are suffering are some of the poorest people on the planet and they happen to have the faith that I have, that many people here have, and they happen to be suffering very badly for it. There is sometimes good news. I think the news about Asia Bibi this week is extremely encouraging, but the truth is that unless we make a real effort and unless the world knows that we are making a real effort, those bits of good news will become the exception and not the rule. And that’s what we don’t want to allow to happen. So thank you very much for your support. I’m sure, I say this in advance as a bit of expectation-setting, I’m sure we won’t be able to do absolutely everything you want, Philip, but we are very, very serious about doing what we can and we’re incredibly grateful for the support of many people here and many people outside as we in the Foreign Office go on a journey and think really hard about what we could do better. It is heartening to read his ‘Johnny-come-lately’ honesty, which is really a vicarious admission on behalf of the entire FCO which has traditionally manifested pro-Arab-Muslim bias in its global diplomatic efforts, much to the consternation of prime ministers. What is concerning is to read the confusion (which it appears to be) between freedom of worship with freedom of religion. When the Foreign Secretary says: “.. freedom of worship is the invisible line between open societies and closed societies”; and “Where freedom of worship is hampered or prevented, then usually that’s a sign of lots of other things going wrong”, he is plainly referring to freedom of religion, is he not? There are very few nations on earth where Christian freedom of worship is hampered or prevented: that is, the freedom to pray and sing hymns in church or the privacy of one’s home. The issue is freedom of religion: the right to manifest that faith in the public realm. Freedom of religion includes the right to have a faith, to manifest it and propagate for it, alone or together with others, also in the public arena. It also gives the right to change beliefs and religious affiliation. This is what democracies would adhere to. Freedom of worship is a definition practiced (sic) in countries influenced by Islam. You may be allowed to be a Christian, but you mustn’t take it into the public arena or share your faith with others. If you are a Muslim you are free to be a Muslim and display it publically (sic) but you can’t leave Islam. A shift from ‘freedom of religion’ to ‘freedom of worship’ moves the narrative from being ‘in the world’ to the physical confines of a church, temple, synagogue or mosque. Freedom of worship is meaningless for the Christian if it may not be performed in spirit and in truth; if it may not be the result of vibrant, living relationship with the Lord; if it may not sear the conscience daily on the life-long journey of faith. 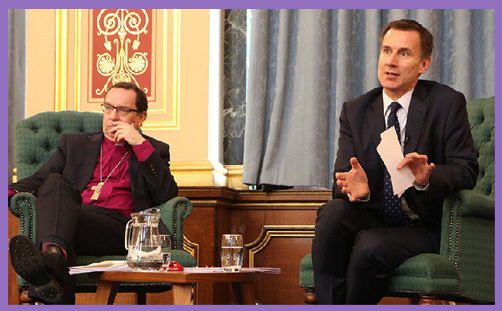 That appears to be where Jeremy Hunt wants to steer the FCO, but whoever drafted this speech somewhat diminished (either accidentally out of religio-theological ignorance, or purposely out of cultural bias) the stated global mission which the Bishop of Truro is helping to shape and guide. Henrietta Blythe, Open Doors: Thank you we are so encouraged by this review. You’ve mentioned that we shouldn’t underestimate our strengths as a global power. I wonder if you could please tell us a bit about how you see British influence improving the lot of our persecuted Christian brothers and sisters. Foreign Secretary: Well I don’t want to pre-empt what the Bishop of Truro is going to tell me that I should be doing. In my short time as Foreign Secretary, the observation I would make is that you do have to treat different countries in different ways. And that’s because they react differently, but also because the state of our relationship is different. So if you take a country that is often in the news for different reasons like Saudi Arabia, we actually happen to have a very good relationship, and we have access at the highest levels. So that is a country where sometimes a private approach is the most effective way of getting change. There are other countries where you would take a different approach. I was always inspired by – and I say this as a Conservative without suggesting that this isn’t in any way a party political comment. I was also inspired by a story I read about Margaret Thatcher in her biography. In her regular meetings with Gorbachev at the end of the meeting she would always say, “and by the way how is Mr Sakharov”, who was languishing in some prison somewhere. And sometimes she would say, “I wonder if you could just pass on this present to Mr Sakharov?” and sometimes it would be a book. And it was never public, and it used to drive ‘Gorby’ absolutely mad. But somewhere deep down it lodged with him that she had asked the question, and when the time came he made the right decision. So that’s why I feel that you can’t really know quite when it’s going to happen. Paul Robinson, Release International: Foreign Secretary thank you, we think you’ve stuck your head above the parapet on this issue. And the opportunity for making a difference is very great. I’ve just come back from Iraq and Lebanon, and the question on persecuted Christians’ lips with a review like this, is how it will actually make a difference on the ground? And can you say how this review will actually focus on the mechanisms that you might put in place to make a difference to individual believers who are being persecuted. Foreign Secretary: Well I might ask Philip to give his thoughts on this if I may. Bishop of Truro: I want to give the Foreign Secretary the tools that he needs to make a difference, and we’ve been very clear about that in the conversations that we’ve had together. That does not mean that this will be a review that does not pull any punches if there are hard things to say. But I do think it’s important that the recommendations we make are deliverable. And I think one of the things I would say to all of you in this room is we are unlikely to produce something that meets all of your expectations, partly because your expectations will be very different. But partly because some of those things might simply not be deliverable. So we do want to make a difference. You know I could be very pious, and produce a very pious report that asks the Foreign Secretary to change the world, and if not the world, then the whole of the UK government’s approach to everything, and that would sit on the shelf and gather dust. I want to give him something that he can actually deliver on, and that will actually make a difference to the way that the UK deals with these issues globally. I don’t know that I’ve answered your question but I did want to say that. So I took the opportunity. Foreign Secretary: Alex from Premier Radio. Alex Williams, Premier Radio: You touched upon it briefly. But I wanted to ask you about the decision that the Supreme Court in Islamabad made yesterday regarding Asia Bibi. Do you see it as a good result? And is it a good result for the UK government because I know Theresa May said in Parliament that it was something that the UK had been following very closely. Foreign Secretary: Well we are obviously very encouraged by what happened. And you know we should not underestimate the challenges for a country like Pakistan which has got huge pressures in standing up for religious freedom in the way that the Supreme Court has done. But our priority throughout has being the safety of Asia Bibi and her family. We have done a huge amount of work behind the scenes, working with other countries as well. And we’re still very hopeful of a good outcome. But I think it’s also very important to remember that this happens to be the case that has caught the public eye. There are thousands of other Asia Bibis that we don’t know about with much less positive outcomes, and that’s why this review is so important. Bishop of Truro: So [this review] is about change more broadly, and indeed perhaps policy change as well. This is an issue that affects tens of thousands if not more in Pakistan, and in many other places. Foreign Secretary: And the final question, Patrick from The Guardian. Patrick Wintour, The Guardian: The UK already rubs up the many Islamic and autocratic states in meetings by demanding action on human rights either in private or public. Are you not just adding another gripe which will annoy these countries and reduce UK influence? And how finally, do you prevent this becoming a vehicle for right wing Islamophobia as you said, you’re sure it will not. Foreign Secretary: Well first of all on the second question. I just don’t think there’s any possibility of this becoming any vehicle for malign influence. And the reason is very straightforward, that we press equally hard for all faiths. So long before I had any engagement with Bishop Philip, I was working very hard on the issue of the persecution of the Rohingya in Burma, and it is largely because of their faith that they have suffered the most appalling ethnic cleansing, and what the UN allege to be genocide. So you know there is a very, very serious issue there which we’re looking at. So I think we are doing this completely blind to the specific religion involved but where there’s an issue we should do something. The first question is an important one. And I think it’s really about the way you raise these issues. We last met I think when we were both in Iran, and we raised some very important human rights issues with the Iranian government. But my view is that a lot of Britain’s power and influence isn’t just about our economic clout in the world, and our military strength and all those things. It’s also because across the world we are seen as a country that stands for certain values, in particular we are seen as a country that together with the United States after the Second World War set up an international order which for all the terrible stories you read in the newspapers has probably been the most successful international order in the history of humanity, and people associate us as being one of the architects of that order. And therefore they’re looking for us to take a lead on issues like this, but not only issues like this, but also issues like climate change and media freedom which are not just important for the UK, but important for everyone. And so that’s why I think it is important that we do look at these campaigns and do the right thing, whilst recognising that diplomatic realities mean that we’re not always able to do as much as we want, but that doesn’t mean that we shouldn’t do anything at all. How, pray, can one launch and independent review specifically into the persecution of Christians across the globe, and then hope to intervene to bring an end the suffering and trauma endured specifically by Christians, if one is “completely blind to the specific religion involved”?